If you wish to make a name for yourself as one of the greatest Jedi in the universe, then you need to model yourself after those that have already achieved the status as a 'great'. Sure you could follow in the footsteps of those in the Skywalker or the Kenobi bloodline but why not be a bit more adventurous and unpredictable? One of the greatest Jedi bloodlines is that of the Koon family. Plo Koon is among the most powerful Jedi in all of history and his ancestors have always been strong with the Force. Now, some of his family's amazing abilities can rub off on you when you arm yourself with this officially licensed Plo Koon Lightsaber! Once you master the powerful Djem So Lightsaber form, as Plo had done, you'll be a worthy challenge for any Jedi on the light or the dark side. 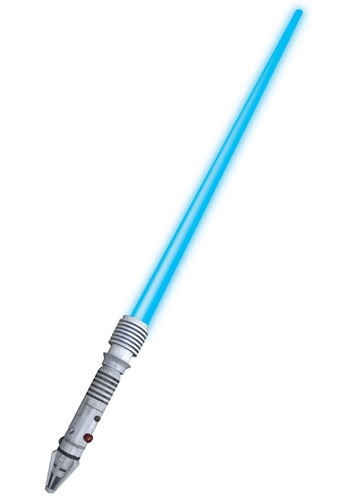 So if you're ready to follow in the footsteps of one the universe's most underrated Jedi then complete your Star Wars outfit with this Plo Koon Lightsaber and start doing your part in bringing balance to the Force!